Stock status is current as of 4/26/2019 10:13 AMET. Take control of two PCs and free your desktop from clutter with the 2-Port VGA and USB Micro KVM with Audio from Cables To Go. 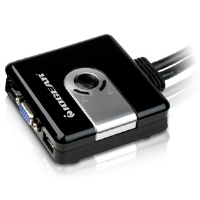 This powerful, compact KVM solution provides everything you need to control two PCs from a single USB keyboard, monitor, USB mouse, and speaker set. Fully integrated, single-jacket, six foot cables attach to your PCs to eliminate tangles and provide a neat, clean appearance. The small footprint of the switch makes it perfect for desktop applications. 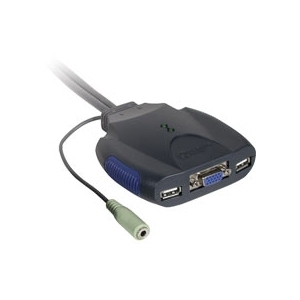 The 2-Port VGA and USB Micro KVM is small in size but provides big box functionality. It supports video resolutions up to 2048 x 1536 while providing full keyboard and mouse emulation to prevent system lock-ups. 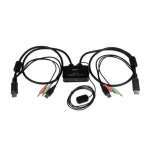 With no software required, installation is hassle free; simply connect the cables and power up! Hot key functionality enables you to switch from PC to PC without ever taking your hands off your keyboard. The KVM's LEDs clearly indicate which system is selected.